For those who have been under a rock, Crazy Eddie was an electronics store in New York, and in the commercials was a DJ portraying Eddie and he's slashing prices and beating all deals. You know the drill. I remember when cable was first out nationwide, seeing his commercials if I flipped past the WWOR channel. According to Wikipedia, the real Crazy Eddie did some serious criminal stuff, fled the country but ultimately came back to pay his dues in jail. He just died a month ago, in fact. For the recent Orland show, the spirit of Fast Eddie was apparent. Quantity wise, I grabbed dang near as much cardboard that was pre 1980 as post. And I could have gone insane with my spending if I didn't get overly selective and have my want lists a cell phone away. Only 40 years into building the complete 1977 Topps release. I found 4 cards I needed - two yellow and two orange. I should bite the bullet and finish this off via COMC, but I'll wait until the National next year. Hey - ya never know what you might find at the National. Found nine more for my 1964 build, which puts me franctions of a percentage point over 70% complete. If I recall, that gorgeous condition McCover/Wagner set me back 50 cents. Robin was a quarter maybe, or a dime. You can see the pen marks on Frank Howard. Someone just had to remember this was from the '64 set. It's ok. Quality is fine when the cost is a dime. Fourteen miscuts were found. Not sure if any are better than a 2nd year parallelogram card of Carlton Fisk. Lowell Palmer and his shades play the position of "pitch" for the Phillies. And I thought that was what Europe plays their football games on. Vintage bunts!!!! These were all needed. 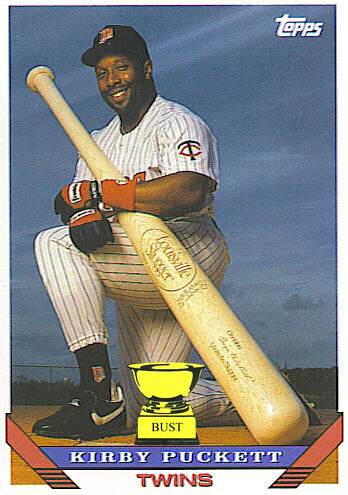 I think Geronimo is using that bat Kirby Puckett was hugging on his 1993 Topps. The angle of the photo makes that thing huge. The George Banks appears they used the same image, just shopped the position of his arm and put a ball in his hand. The Kellogg's at the top is Ron Hunt. Yeah - exactly. Luckily, Wikipedia tells us he holds the record for most hit by pitch in a single season (since 1900) with 50. He's third in career hit by pitch with 243. However, he did it with 3000 less at bats that Baylor in 2nd and 5000 less AB than the leader Biggio. Lots of Sox. 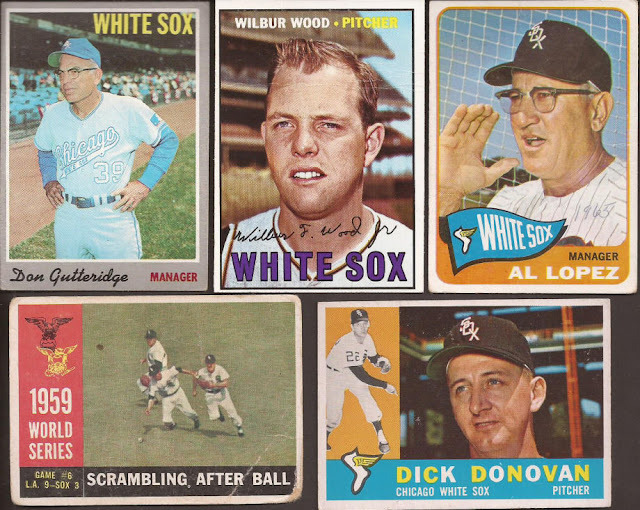 I am sure I grabbed a few I didn't need, like 3 1971 Wilbur Wood cards. Yup - 3. Anybody need one? But I killed a lot of the mid 60's needs. That '59 series is probably the worst condition wise, besides the pen marks noting the year you see on the Al Lopez. Again - condition don't mind when the cost is a dime (or two). 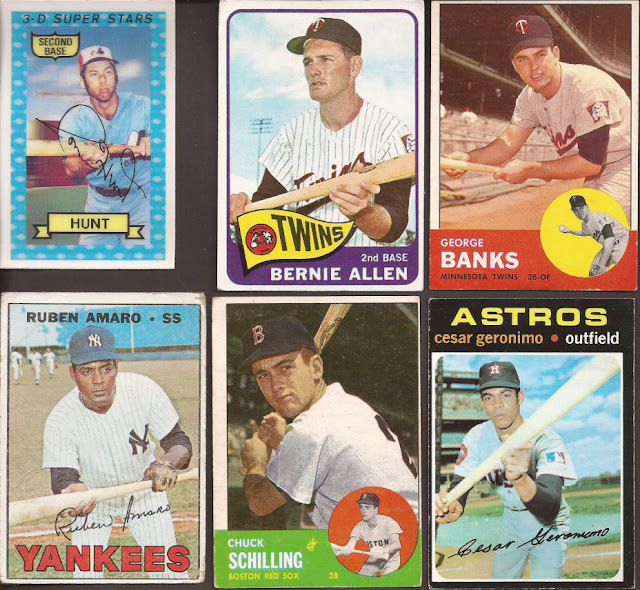 And not just baseball vintage for cheap prices. I could have destroyed my budget with the amount of easly 70's Topps and OPC in the 5 for a buck box. Grabbed what I enjoyed, though. 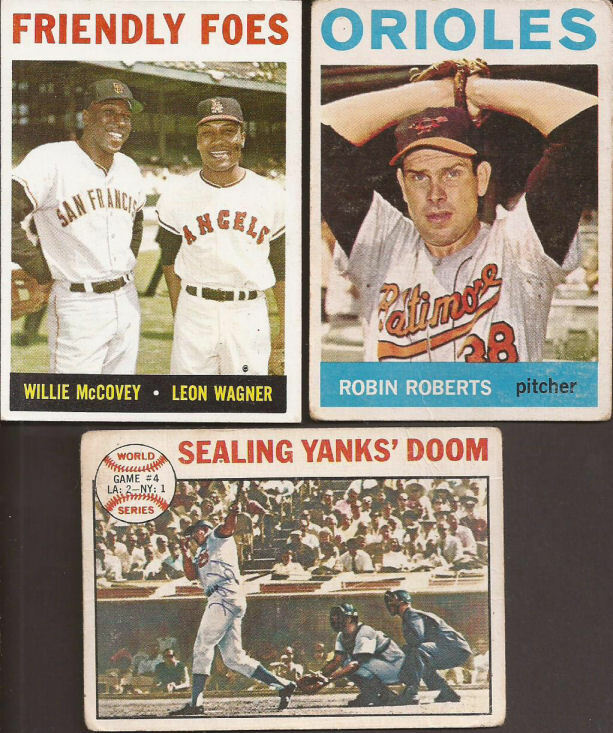 Like some vintage Topps of defunct teams like the Seals and the Scouts. Found a couple Atlanta Flames too. No Rockies, though. And my Blackhawks box got some needed help with a dozen or so vintage finds. I will take any and all Maggie's when you price them under a quarter. Pappin scored the Cup clinching goal for the Leafs in 1967. Bill White was paired with Pat "Whitey" Stapleton in the early 70's, becoming one of the best pair of blue liners in the league at that time. The find of the day, though, was this gem. The cost? A buck. 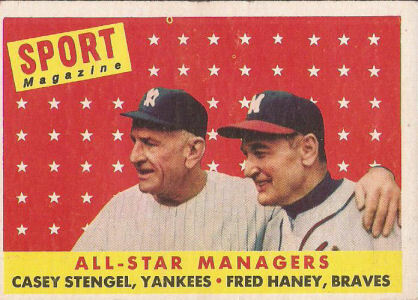 Someone offers you a card of Casey Stengel for a dollar, you shut your mouth and take out your wallet. 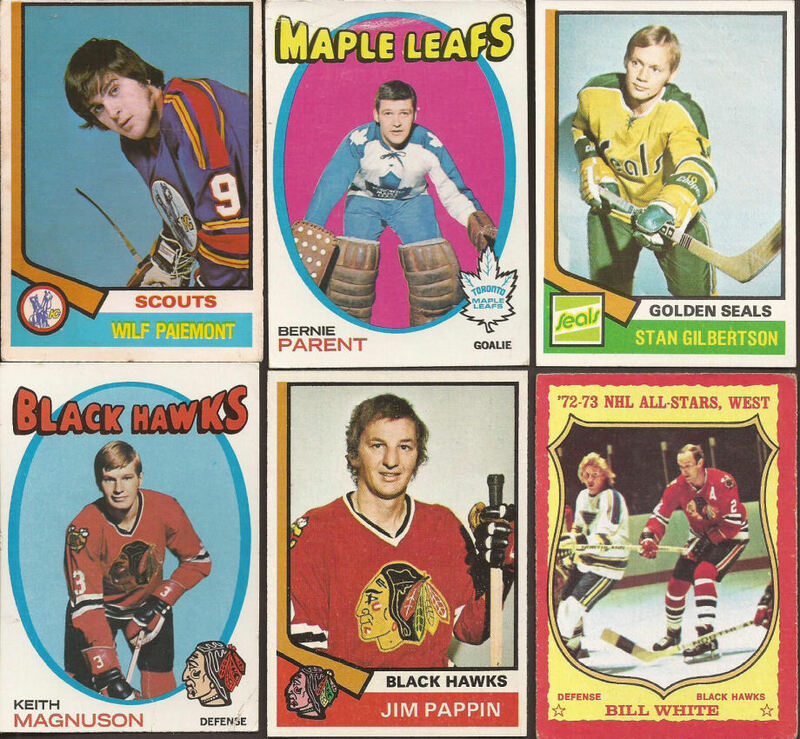 Wish my local shows had a box of vintage hockey for me to thumb through. Great finds all around, those miscuts are glorious. I love that clean shaven Bernie Parent card, and Jim Pappin's nose is a thing of beauty. Love cheap vintage. 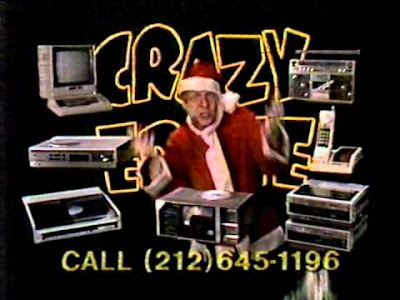 And crazy Eddie! Is that proper enough geometry for ya? Cool vintage. Crazy prices... The booth girl distracted me there were some crazy cars you said? Don't think you showed me that Stengel when we were at Orland on Sunday, such a fantastic card to cap off an all-around fantastic show. While I don't usually buy cards most would consider "vintage", I still like reading posts such as these. Love the Star Wars cards by the way...the 70's and 80's entertainment cards were some of the best. Love that limited edition '73T Fisk parallelogram card! 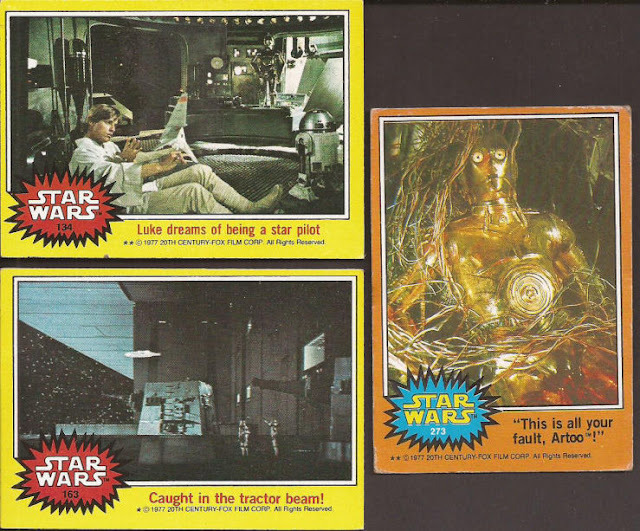 Looks like you're down to the nitty gritty on the 77T Star Wars set. Do you care about condition? If not, I might have a few off of your want list. Solid haul! Yeah, that hand-numbered "1\1" Fisk is pretty sweet.